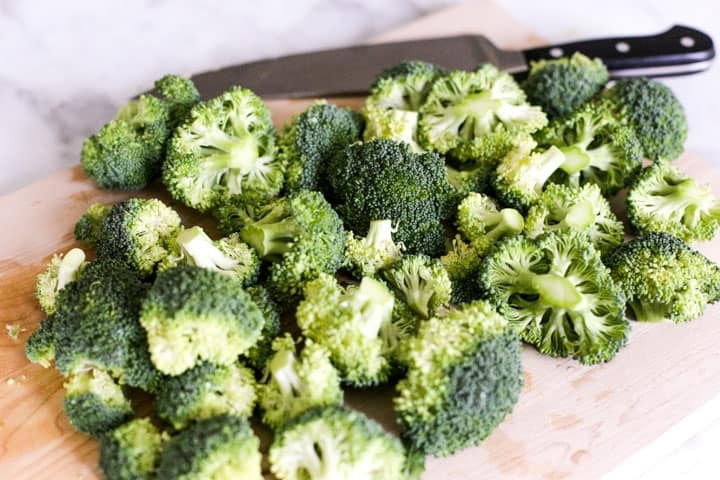 This Easy One-Pan Roasted Broccoli recipe is the perfect side dish on its own, or add the florets to a salad or casserole to bump up nutrition and crunch! Face it. Broccoli is magically nutritious. You know you should be eating it on the reg. And if you’re lucky enough to enjoy the slightly bitter taste, you are probably looking for ways to add this health bomb to your plate. I’m feeling healthier already, aren’t you? 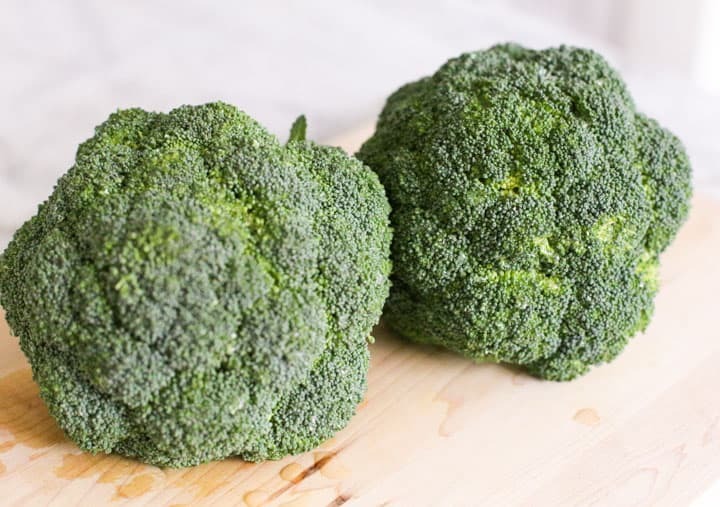 There are many ways to cook broccoli–boiled (please don’t) steamed, sauteed, or stir-fried. My favorite way is roasted. It’s so simple and the flavor pay-off is huge. 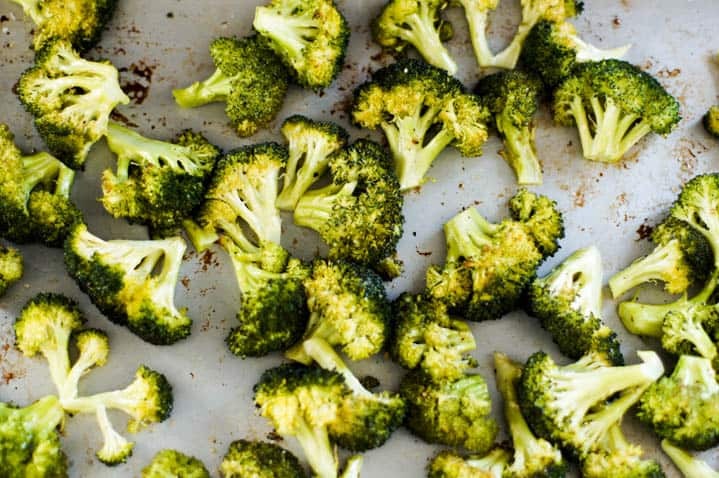 How do I make Easy Roasted Broccoli? Let’s start with two heads of broccoli. Wash them off and pat them dry. Then cut all the florets off the stalk. Now let’s coat the florets with some extra virgin olive oil. You could toss it in large bowl, but I prefer to just do it on the sheet pan. One less thing to wash, right! Sprinkle on some salt and pepper. What Temperature do I roast broccoli? I have found that I like to roast broccoli at 400-425 degrees for 20-25 minutes. This allows for a nice even browning without overcooking. The broccoli should not cook to the point of being soft. At the halfway point, take the sheet out and give the broccoli a toss so it cooks evenly. Nutrition information in this post was found on WebMD. 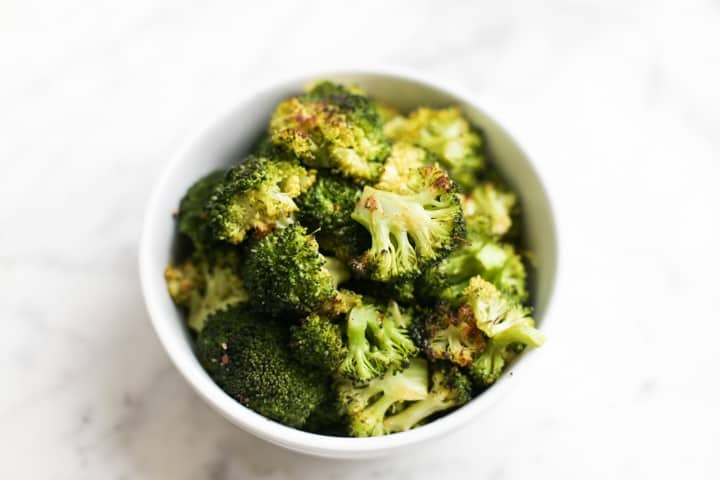 This Easy Roasted Broccoli recipe is the perfect side dish on its own, or add the florets to a salad or casserole to bump up nutrition and crunch! This recipe is delicious as is, but it’s only a staring point. 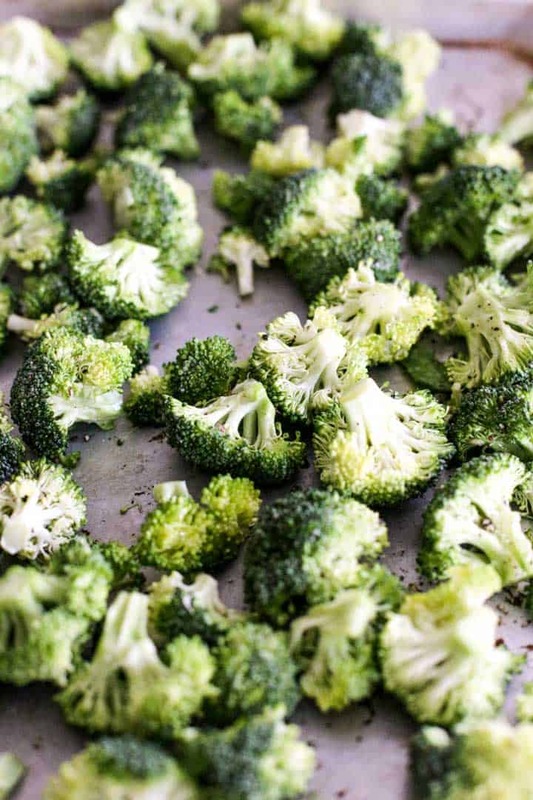 Try these ideas to take Easy Roasted Broccoli to the next level. Add lemon zest and fresh lemon juice to the broccoli after it’s been cooked. Toss with shredded parmesan or feta. Drizzle with sesame oil and toss with lightly toasted sesame seeds. 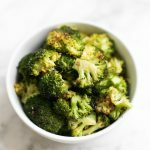 If you made this Easy Roasted Broccoli, or any other recipe on the blog, don’t forget to leave a rating and a comment below. I love hearing from my readers! 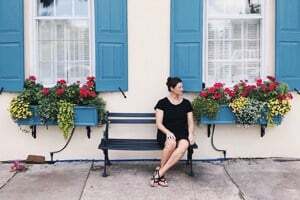 You can also find me on my favorite apps – Facebook, Instagram and Pinterest! My boyfriend loves broccoli but I have never served them roasted! I will definitely try as a lot of them are sleeping in the freezer. Thank you! Hi Ai! Yes, you must try them roasted. Add a squeeze of lemom when you take them out of the oven-so yummy! Yum. I eat a lot of broccoli but I’ve never tried it roasted. I will try that next time I cook it. Have you ever tried it as a pizza topping? It’s delicious with chicken and cashew nuts, and cheese of course. Hi Lyn! Thanks for commenting. I’m going to try your pizza idea-it sounds really delicious!